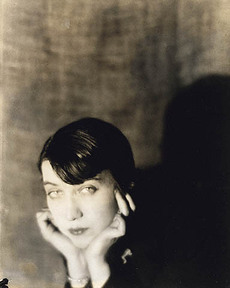 Ahead of her time all her life, Berenice Abbott was raised by her single, divorced mother and dropped out of Ohio State to move to Greenwich Village. That was 1918, and the following year she nearly died from the influenza pandemic. Two years later she moved to Europe to study sculpture, and two years after that she fell in love with photography when Man Ray hired her as his assistant specifically because she didn't know anything about it and therefore would do exactly as told. (He captured her, at left.) By 1926 she had her own studio on the rue du Bac before moving to rue Servandoni the next year. While quickly achieving renown for her own work, Abbott tirelessly promoted other photographers, particularly Eugene Atget, whose images she championed for forty years until 1968, when she convinced the curators at MoMA to buy the archive of his photos. Although she was extremely sought after in Paris, taking portraits of everyone from Jean Cocteau and James Joyce to Coco Chanel and Janet Flanner, a quick trip back to New York caused her to abandon France and return to Manhattan in order to photograph the city. For six years she worked without any support, rejected by organizations and individuals who failed to see any value in her vision. In 1935, however, the Federal Art Project hired her to continue her series, now called Changing New York . These are her most enduring images. During this time she fell in love and began living with Elizabeth McCausland, a critic, and they remained together more than thirty years until McCausland's death in 1965. Abbott lived on until 1991, not only widening her subjects to include antebellum architecture, U.S. 1, and Maine, but also inventing photography gadgets like the distortion easel and the forerunner to the autopole. The video below contrasts Abbott's iconic views of New York in the 30s with the same locations as they looked in the 1990s.